Long Side is the middle summit on the western ridge of Skiddaw, curving around the western side of Southerndale. The summit stands out when seen from the west as a clear peak on the ridge (at least when the light is right - sometimes the entire western ridge merges into the backdrop of Skiddaw). On the map Long Side appears to be a fairly indistinct part of the ridge between Ullock Pike and Carl Side, but on the ground it becomes clear that it would be fairer to consider Ullock Pike as an outlying spur of Long Side. There is a drop of over 200ft when heading towards Ullock Pike from Long Side, but a climb of only 50ft to reach the summit of Ullock Pike. In the other direction you drop 160ft and gain 180ft to reach Carl Side. Long Side is only reachable by walker by using the ridge from Ullock Pike to Carl Side and Skiddaw. Likewise Ullock Pike is only reachable along the ridgeline, with starting points near Ravenstone and Barkbeth. There are more possible routes up Carl Side, including rough scrambles out of Southerndale and the valley of Slades Beck and a better path up the southern flank of the fell. The highest point on the fell is part of a long narrow ridge, with heathery slopes to the west and more rocky slopes to the east. The views east are blocked by Skiddaw, but in other directions there are wide ranging views, with Scotland seen to the north and the heart of the Lakes seen to the south. 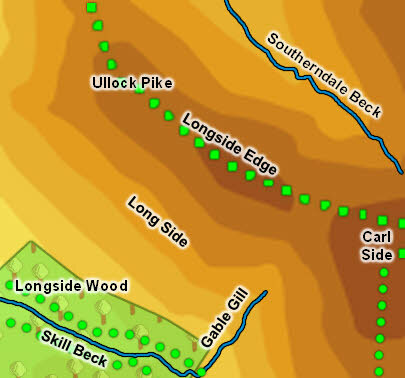 As part of a ridge Long Side is bordered by two streams - Southerndale Beck in the north and Skill Beck in the south. The only beck that actually runs down the ridge itself is Gable Gill, which runs south between Longside and Carl Side.